12. Alfred Edward Mathews (1831-1874). Exit of the Yellowstone from the Mountains. Tinted lithograph, Plate 15. Mathews, A.E. Gems of Rocky Mountain Scenery. New York: The Author, 1869. St. Louis Mercantile Library at the University of Missouri - St. Louis. "Nothing can exceed the grandeur of the mountain scenery of the upper Yellowstone. 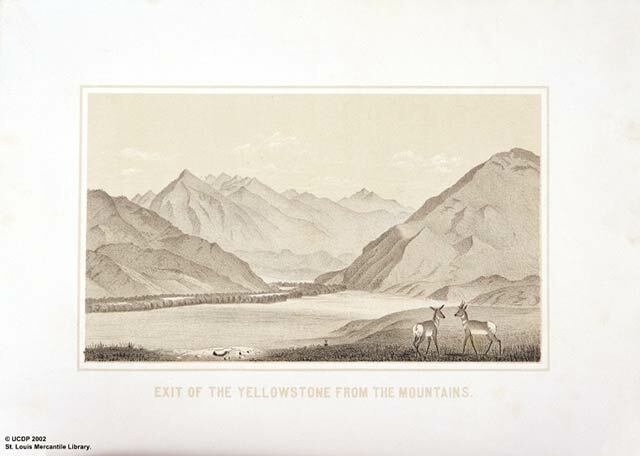 The view represents its exit from these mountains, as seen from a pint three miles below, and thirty miles from Bozeman, in the Territory of Montana."